…judging from these four lined up next to Flagstaff Gardens. Unfortunately while they might be plentiful in the CBD and inner-suburbs, it might be a while until they reach spots further out. I suspect that there’s not that many people in Bentleigh who would get rid of their own car and join up. I’d certainly be tempted. As opposed to within the Flagstaff Gardens where needle sharing is popular. If I could take one from Lilydale Station each night and bring it back the next morning, it would be perfect. Of course, if the government put in enough money to buy *one* more bus and pay a driver, I wouldn’t need to drive to the station at all. Are they parked in a bus stop? Glad to see car sharing is taking off a little. It’s a small piece of a larger solution. 1) The Government doesn’t tend to buy buses. Bus companies do. 2) There’s no need for any more buses at the moment. What’s needed is rationalisation of bus routes and timetables. Stop buses from duplicating routes of trams, trains and other buses and we’d have a much higher frequency on a smaller number of routes. @Frank, no, they are dedicated car share spaces allocated by the council. @Julian, true it’s the bus companies that buy the buses, however this is directly influenced by the contracts for services that they are paid for by the government. While it’s true that a lot more can be done with the current bus fleet, I’m not sure if anybody’s done the sums to work out if more or less or the same number of buses would be needed with the “ideal” network design. The bus company told me it needs another bus to manage this particular task because all of its buses are in use during the evening peak, when I want one to go to Yarra Glen. They could probably rustle up an extra driver to do it, but they don’t have the bus and the DoT hasn’t declared that the service has to run, despite it being an election issue and being highlighted in a recent bus service review for the government. So I get to put up with a 90 minute gap between services, right on the evening peak period, because customer numbers dictate that a service direct to Healesville is more important. Car sharing is a great idea for people who only need a car sometimes. About 15 years ago, my car died and I had to get rid of it. I thought that in a couple of weeks I would go get another one, but I didn’t get around to it for 4 years. But in those days, there was a business renting old cars for about $35 a day just down the street. Its gone now. The big catch with car sharing, is that sometimes, too many of the customers will want to use the car on the same day. @Daniel – Considering the average bus loading is approximately 5 people now, I’d say we’ve got enough buses. By rationalising the routes and removing as much duplication as possible we’re likely to have far less routes, with a much higher frequency. It would obviously involve more connections, offer many more people a service that can be relied on and will attract more passengers. What happens if some moron parks in the car share bay and you come back to park the share car? After looking into carshare schemes I’ve found it more cost-effective to simply hire a car on the odd occasion I need one. However I’m sure the program works for some. 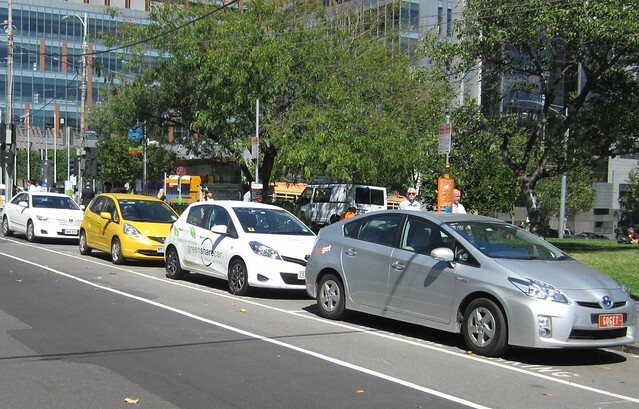 We signed up for FlexiCar a couple of years ago when we were renting in North Melbourne while looking for somewhere to buy, bayside off the Nepean (ended up in Mordy). There were two cars available near us – usually a Subaru Forester near the station and some little Toyota or Honda near the Three Crowns on Vic/Errol St.. the Forester was a dollar more per hour. I don’t recall the exact details, but we paid a monthly fee and got a few hours driving. The system works well most of the time, the remote vehicle acccess control and GPS tech was impressive. Hiring a car for a day was an option of course, but to be able to pick up a car parked around the corner and use it for an hour or two to do the weekly shopping was v useful. Over the year we were with them, we had a few hiccups with the account, lost property and some ‘sharers’ leaving the car with hardly any fuel or litter strewn in the footwells, but everything was dealt with professionally over the phone or in person at their Little Lonsdale office (think they may have moved since). It was what we needed, when we needed it…I hope the demand for car sharing inceases. @Aaron, I’ve been a very happy Flexicar user for 3+ years. The big plusses over regular car hire is that you can book a car online in seconds and there’s no time consuming collection procedure, it’s a 24 hour operation (I collected a car at 0720 this morning and returned it at 1830) and it’s cheaper once you add the insurance supplement that regular car hire firms charge to get rid of the ridiculous excess (e.g. an outfit like Thrifty will quote a Flexicar-beating $50 a day, then you find out that the excess is $4000 for damage however caused [massive hailstorm?] and if you want to get rid of this it’s an extra $33 or so). Actual cost depends on the plan you’re on – I’m currently on the high-use plan so a Corolla sedan costs me $65 a day including fuel for up 150km. Given the move towards new CBD no/limited parking apartment developments, I would expect car sharing to get a lot more popular. @Tony: Re the insurance rental scam: I’m not quite sure why you can’t insure your car on a concurrent seat model: IOW, if your car is at the crash repairs being fixed, the replacement rental car should be insured by your car’s insurance. Etc. We go close to that by insure per km driven, after all.